This article contains some best practices to help you improve your customers’ experience during the holiday rush. Typically, Zendesk Support volume for retailers increases by about 42% during the holiday season. It’s important for your team to have the tools they need to handle the extra workload. Tip: An on-demand webinar is also available on this topic. Click here to sign up. Recognize that customer satisfaction is the foundation of your business. Holiday seasons are busy times for both you and your customers. They expect businesses to be available when they are shopping, and be responsive quickly when they’re in a rush. Make sure your agent resources are hired and trained before the busy season starts. Consider Zendesk subscription plans that allow you to add temporary agent accounts to help with the seasonal workload. Take advantage of Zendesk training resources which are available to get your staff up and running. Create agent-facing Help Center articles with internal-only permissions so your agents can quickly access your corporate policies and procedures. The majority of customers (60%) prefer self-service to speaking with a Customer Support agent, so it’s important to understand the types of requests that come in during the holidays and identify if there are any gaps in your content. For customers on Support Professional and Enterprise, you can use Insights reports to help you understand what customers are asking. Build a report that surfaces questions asked frequently during the holiday season, then create a drill path on ticket_id to learn more about the specifics. Once you identify some of those common tickets (or common themes) that occur during the holidays, you can drill down into each ticket to learn more about the context. 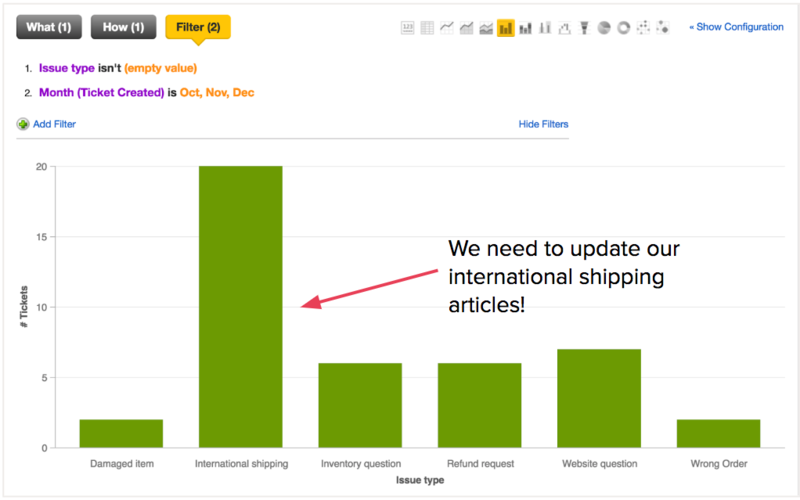 For example, with this simple Insights report, we’ve identified that customers need more information about international shipping. This example uses the following settings: What: #Tickets, How: Custom “About” or “Issue” fields, and Filter: Months Oct-Dec. For more reporting ideas, check out the Zendesk Insights recipes reference. 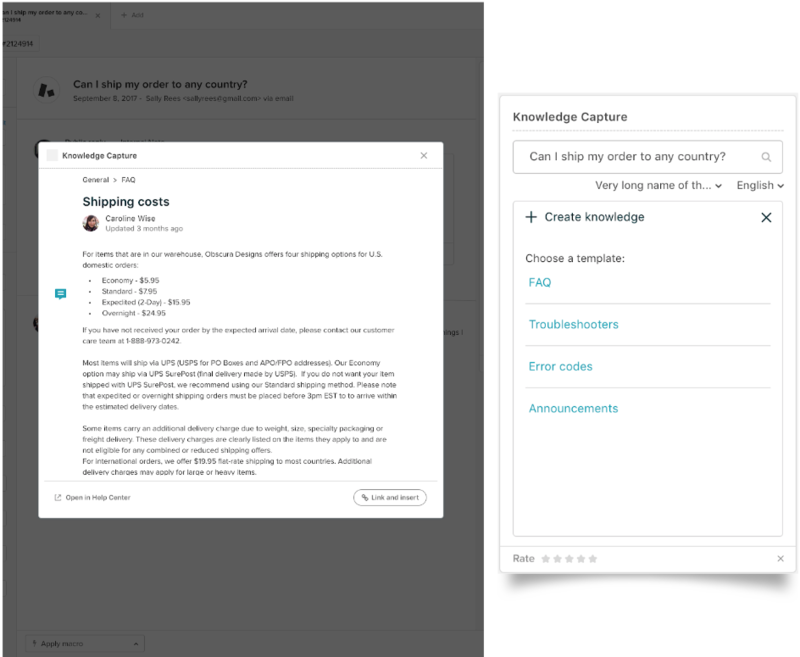 Based on your Insight findings, you can use the Guide Knowledge Capture app to surface and update your articles with the best, up-to-date answers. The Knowledge Capture app allows agents to preview Help Center content and suggest feedback on articles directly from the agent interface. Frame each of your articles in a question context and have them cover only a single problem. This structure makes information easier to find and will help your team achieve success with Answer Bot. Make the subject line as descriptive as possible and make sure the article subject line matches the article content. If you are a Guide Enterprise customer, you can create a holiday-themed template for articles or for a special section or category. You can use the holiday template for special holiday articles while their regular content keeps the usual, non-holiday template. You can leverage the machine learning provided by Answer Bot to help you reduce agent workloads and enable customers to self-serve. Answer Bot automatically recognizes the context of questions within customer emails and recommends relevant articles while customers are waiting to hear back from an agent. If the customer finds the article helpful, they can close the ticket and automatically solve the ticket themselves. Answer Bot is available as an add-on for Guide Professional and Enterprise. Improve the quality of your articles by framing your articles in a question context, and create articles that are relevant to a specific question. To help identify relevant articles, label your popular articles with descriptive keywords that match your customer requests. For example, size and fit, billing, international shipping, or returns. Place an embedded Web Widget on each shopping page. This allows customers to quickly find answers to their questions. With Web Widget, you can offer multiple ways for customers to contact you: Chat, email, or allow them to browse your Knowledge Base. Enable contextual help which suggests articles based on the page that the visitor is browsing. This helps customers find much more information on your site, relevant to what they are looking for. Add the power of Answer Bot directly into the Web Widget to offer powerful self-service capabilities for customers. Use proactive chats to assist buyers on your shopping cart page. A proactive chat can help customers complete their sale and it opens the door for your team to provide additional help. For example, you can use Chat to ask customers if they have additional questions, provide links to your holiday FAQ,or provide discount codes. Take advantage of Zendesk Chat features, like departments, which allows you to route chats to specific teams to help with specific customer requests. For example, you can set up a team of agents in a holiday sales department who can help resolve tickets from customers who have purchase issues on your shopping cart page. Zendesk recommends integrating with a popular retail applications such as Shopify, Magento, or Big Commerce. These integrations enable you to surface information about your customers from directly from within Zendesk. They can provide you with visibility into customer profiles and display order information. Use the Gift app to provide a personal touch with your customers and make your customer service stand out. You can send physical gifts to customers with just a few clicks, increase customer loyalty, retention, and customer satisfaction ratings, and help smooth over issues for customers who have holiday frustrations. Additional apps you might consider include: Survey, an app to get more-detailed customer satisfaction data; Out of Office, an app to track the availability of all agents in your account; and SightCall, an app that enables support agents to engage in live video interactions with customers sharing their issues in real time. Zendesk continues to add new features to improve agent workflow. Follow the Zendesk Community and Announcements for the latest information. You can also use Chat’s built-in conversion tracking to measure how your team is helping with in-sales revenue. It’s a great way to recognize and reward your team. Review your account trigger settings. Make sure you don't have triggers with repetitive functions that can slow down processing time. Also, review and confirm if triggers that proactively greet each site user are really needed. Consider saving these proactive triggers for times when Chat traffic is lighter. Consider enabling the High Load Dashboard. Zendesk recommends this dashboard for high traffic situations (5000 or more concurrent visitors). See Using the High Load Dashboard. @Lisa: Really great article, nice work and covers a number of good prep steps in readiness for peak periods. However, I do need to call out one item - being one of the eCommerce integrations mentioned - specifically Big Commerce, developed by the Presence Group. This plugin has some significant deficiencies, in terms of usability (need to constantly login to BigCommerce, no OAuth or easier means); broken links to stores, orders, and customer information; and support for these issues isn't timely. Would be great to see Zendesk develop an official plugin for BigCommerce, as well as update the plugins they've already developed for other eCommerce platforms, to surface information as part of Sunshine Events.